© Civil, Architectural & Environmental Engineering, Drexel University. Users of the virtual nondestructive laboratory are able to try out different tools to gauge the condition of a virtual bridge. This tool checks for any internal damage inside the bridge's concrete by using sound waves. Bridge inspectors today are fortunate to have access to emerging technologies that can help gauge the internal condition of a bridge. For example, some tools use sound waves that travel inside a bridge; others use infrared thermography to detect temperature changes inside a structure. But inspectors and civil engineers acknowledge that these technologies have yet to be deployed to their fullest potential. One way to identify how to optimize these technologies is by developing a virtual environment where researchers can demonstrate new techniques in a realistic but shared, simulated environment and where engineers and inspectors can test new tools. Researchers at Drexel University, with assistance and funding from the Exploratory Advanced Research (EAR) Program at the Federal Highway Administration (FHWA), are doing just that. They are developing an online laboratory where inspectors and engineers can try out diagnostic tools with the latest in advanced technology to study and examine the condition of virtual bridges. The virtual laboratory includes data from real-life bridges, controlled specimens of structural elements, and technology used to assess structural conditions. The virtual bridges and bridge elements serve as “digital twins” of real-life bridges located in various parts of the United States; controlled specimens are developed in laboratories, meaning that these virtual bridges and specimens have the same problems or conditions as their real-life counterparts. Website visitors can use different tools to see how they would address the problems posed by these virtual bridges and specimens. The virtual nondestructive evaluation (NDE) laboratory allows users—engineers, researchers, students, service providers, and bridge owners and inspectors—to engage in simulations of real-life bridges that exhibit various symptoms of bridges’ conditions. Some of these symptoms may be occurring inside the bridge, so the only way to look for deterioration inside a bridge and its components is to use tools that “see” inside the bridge. “Nondestructive” means just that—bridge inspectors and service providers use examining tools that have sensing capabilities to look for deterioration without actually damaging the bridge. However, bridge inspectors and civil engineers acknowledge that new tools and the emerging technologies behind them have yet to be deployed to their fullest potential. As a result, the virtual NDE laboratory aims to further the understanding of how these tools can be best used. This understanding will be completed in two ways: creating a portal that explores and interprets NDE data in a visual format and allowing users to interact and explore NDE tools and the data through simulations. To create this laboratory, researchers collected data on real-life bridges. That data included high-resolution scans of bridges during different seasons as well as the results and observations about the bridges’ condition as gathered through NDE testing tools and sensor technologies. 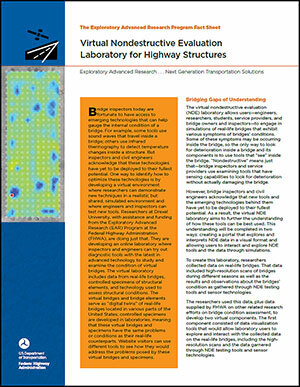 The researchers used this data, plus data supplied by FHWA on other related research efforts on bridge condition assessment, to develop two virtual components. The first component consisted of data visualization tools that would allow laboratory users to explore and interact with the collected data on the real-life bridges, including the high-resolution scans and the data garnered through NDE testing tools and sensor technologies. The second virtual component consisted of two types of simulation. The first type enabled laboratory users to formulate and execute physics-based simulations at two levels, at the material level— simulations on a slab or a segment of the bridge—and at the system level, which is the bird’s eye view of the bridge. The second simulation type enabled laboratory users to engage with the logistical aspects of NDE data collection via interactive lab and field-based virtual data collection scenarios. The simulations allowed laboratory users to collect NDE data as if they were in the field examining the condition of an actual bridge. Researchers hope that the collected case studies will help website visitors understand the reasoning and logic behind why different situations call for various tools.